Description: Large, plump, and long-tailed. Dark, stubby, strongly curved bill. Two white wing bars, sometimes tipped with pink in male. 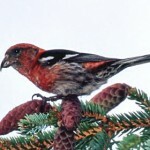 Male is dull rose red overall with dark streaking on back; black wings and tail; and gray on wings and sides. 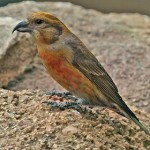 Female and immature have gray underparts and shoulder patches; head color varies from yellowish to reddish. Habitat: Normally associated with both deciduous and coniferous seed-bearing trees. Occasionally found in orchards and suburban shade trees during the winter. 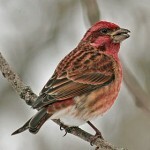 Where in Nebraska: Rare and irregular winter visitor with vagrants appearing in various places across the state. Can be an irruptive winter migrant. 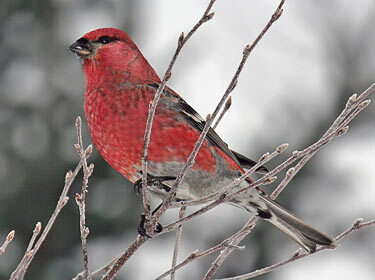 Fun Facts: Pine Grosbeak adults when breeding develop pouches to carry food to their young.